Synthetic membrane processes are being increasingly integrated into existing reaction, isolation and recovery schemes for the production of valuable biological molecules. In many cases they are also replacing traditional unit processes. The properties of membrane systems which are most often exploited for both upstream and downstream processing are their high surface area per unit volume, their permselectivity, and their potential for controlling the level of contact and/or mixing between two separate phases. Advances in both membrane materials and module design/operation have led to better control of concentration polarization and membrane fouling. 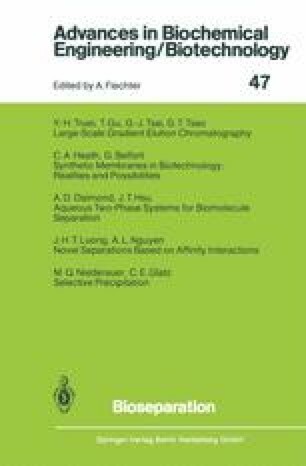 While this article begins by noting some of the recent advances in membrane technology such as new developments in membrane materials and fluid mechanics, followed by integration of membranes into both cellular and enzymatic reaction systems, the primary focus is a review of established and emerging membrane separation processes. Many examples referred to in this review underscore the potential for combining membranes and biological processes to good advantage. We believe that this marriage has only just begun and that improvements in membrane materials and a better understanding of the fluid mechanics in membrane modules and of metabolic processes for reaction systems will lead to an even stronger synergism in the future.